Authored by jriddell on Feb 16 2018, 4:28 PM. Don't add Home.desktop to links folder and don't add trash link. jriddell added a reviewer: Plasma. I asked as an ordinary user. Could you please explain why Home and Trash icons should not be on the desktop by default? These icons are very useful, especially trash icon. I don't have to open dolphin just to empty trash can. Memes aside, I have to agree. This seems like the sort of things that developers prefer for "cleanliness", at the expense of messy ordinary users who like putting junk all over their desktop. This is just following up on a public promise we already made. When we turned Folder View into the default desktop containment, we told everyone (and got a lot of positive feedback from the users for it) that this means the desktop surface now supports icons by default again, but we don't actually place any by default so it's not having any impact on the people who prefer an empty desktop by default. Then it turns out we actually forgot to change the code. This seems like the sort of things that developers prefer for "cleanliness", at the expense of messy ordinary users who like putting junk all over their desktop. What's the point of the desktop if it is not possible to place folder, pictures, music, etc on it? 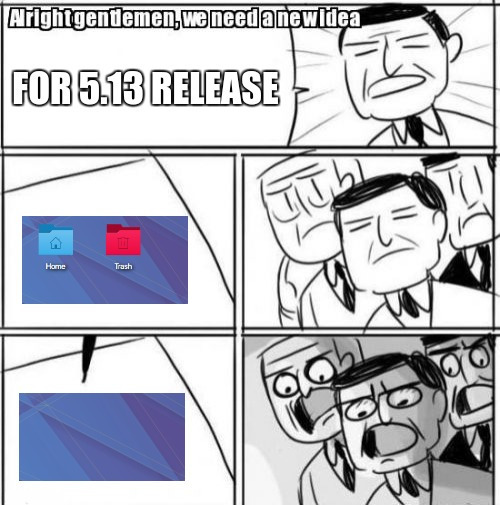 Also, someone could say: "It's Plasma, you can put trash icon back!" The Trash can widget looks different from the default trash can icon + other folder icons(blurry, etc). So, please, let home and trash icons stay on the desktop by default. This isn't about disabling support for icons (we just turned that back on in 5.10 ...), it's about not creating the Home and Trash icons by default on first login. No, you weren't: "What's the point of the desktop if it is not possible to place folder, pictures, music, etc on it?" That was a rhetorical question, which apparently causes misunderstanding. Sorry. ngraham added a task: T7948: remove default desktop icons.